If it seems like Breast Cancer Awareness Month has gone on for a lot longer than its 31 days, as of its official final day today, well, it has, since at least the April part of the month, when Bubba Watson packed the pink driver and won The Masters with it. All this awareness is a good thing, in my eyes, because, for one thing, I rock the look. Pink is a good color on me, and oh yes I do too know how to accessorize around it. 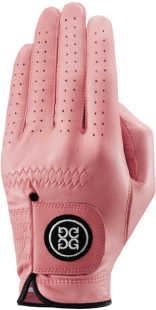 So I was particularly interested to find, through Twitter, a company that brings something new to that sliver of the golf equipment marketplace devoted to gloves. However essential it might be as equipment, as fashion accessory the golf glove is an afterthought. Most male golfers wear white golf gloves. Black is second, brown a distant third. I have no stats to back me up, but I’m right, am I right? Dudes … you, who agonize over the piping on your polo collar and whether it picks up your eyes or echoes the stitching on your hat brim; you, who yearn to stand out among your bland band of buddies … you’re the guy that needs to check in with GFore (@gfore). Here, you can get your white, and accent it with a contrasting logo on the Velcro flap. And of course you can get your black. You can get your two-toned in the Limited Luxe line – I like the Lopez, with the red thumb on white and the green flap. But my first buy will be the Blush (you can call it pink, without fear of contradiction), because I think the 180 days of Breast Cancer Awareness Month should not end today but go on at least another 180. It has something to do with the loved ones in my family (my sister and sister-in-law) who are breast cancer survivors. Awareness is a good thing, because I know for a fact that doctors and researchers are doing new things all the time. I know, because they found my sister’s lump (tiny, at that point) through a new test she agreed to take after her regular mammogram found nothing. My sister took the second test, as a favor, in a pilot project, as an afterthought. My golf gloves will never be an afterthought again. Pink, I think, for now, because it goes with everything. And damn, it looks good on me.